However much tragic or wonderful our life is, we are always hideous about ourselves, about our feelings. We tend to bottle up ourselves not giving the other even a hint of the reality. We are so busy pretending that somewhere we ourselves loose track of the reality playing the game of SELF HYPNOSIS! A state in which we play our game of life with extreme seriousness, disguising ourselves from our own weakness, as well as from our enemy or rival. Not only others we ourselves start ignoring the weaknesses we have, trying to pull off a mask that shines by its cover. But wonderfully said ” never judge the book by its cover”. If I am a bubbly, chirpy kinds on the outside, it doesn’t imply that I am a blessed soul on the inside as well!, If I am silent on the outside doesn’t imply I am satisfied on the inside too! We all have our list of traumas and sad times whether these come from our family, friends , professional life or sometimes from ourselves only! But yes the real fooling comes when we label ourselves to be strong by pulling up a smile on our face even in the wake of adverse times. Is that really being strong? By bottling up my weaknesses or sorrows, giving myself an inner satisfaction that yes I am a VICTIM , I am bearing all this alone and stuff! NO! The reality lies in the fact that this is nothing more than FOOLING around. And yes I am proudly a member of it! The reason I have been doing this my entire life is because this VICTIM zone , this SAD zone has turned into my COMFORT ZONE. Its difficult , nae , IMPOSSIBLE to leave the victim me! But that is where the real strength lies! Strength lies in coming out of the hypnosis, facing reality! Being open about who you are and what you face. Often vulnerability is the reason why I disguise myself. Even when I actually discuss my weakness or my problem with someone a guilt attitude starts riding up. I am worried that either I would be looked upon by a sympathetic eye or would be attacked by a ferocious eye targeting my vulnerabilities. Either way its difficult ! Yes again I say its DIFFICULT . And DIFFICULT in my dictionary is synonymous to STRENGTH. We all have had difficult times and we know these have made us stronger. Expressing yourselves is not making yourselves weak. It means you give the other person the full power to destroy you, you reveal every sensitive detail about yourself , you show them your plan so that they can target you in the best way possible ! But remember attacks are never done without the other’s defense. If you have the power to reveal yourself and your situation to someone outside ( which really takes a lot of power) you have a higher strength of protecting yourself! A highly equipped army never attacks on a weak base, It looks for EQUAL competition! Therefore in case the other person threatens you with their attack, remember you have a higher power of defending yourself! If you can easily make yourselves vulnerable you can also protect yourselves. Maybe you aren’t prepared but deadlines and emergencies have the potential to guide the impossible. Think of a disease that hits your town. No one has ever heard about it and there is no cure to it. People start dying because of this. A state of emergency builds up , the doctors start working on it. And sooner or later a drug is invented which can combat the disease. Similar to this, it may take time to protect yourselves but sooner or later you will be able to do it. 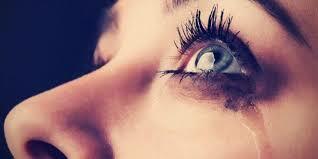 One day the cure that you will find will leave you stronger and more immune to such emotional disasters. So in case you discuss with someone any of your problems or any of your weakness don’t take think of it as a vulnerability, instead take it as a strength that you had the strength to reveal yourselves in the real way you are. But this doesn’t mean that you always need to discuss. A higher strength lies in pulling up a smile on the outside and working upon yourself on the inside. Inner healing is superior to all! 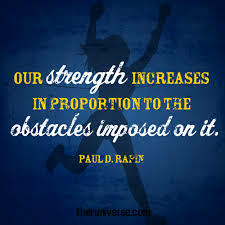 Working upon your weakness and your problems and to be able to come out of the trauma completely on your own will power and determination is the real strength ! And until you aren’t able to do so drive the physical negatives away from your life and stay around positive ones! A cruel message on my card. a ferocious war to avenge. but soon it takes a leave, a scornful bye! killing negativities of anger and hurt! 15 Responses to "STRONGER EVERYDAY :)"
Loved the post..especially the army analogy. 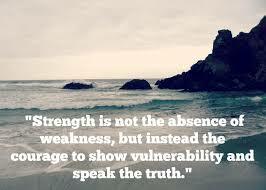 And, I agree that discussing our weaknesses makes us vulnerable, but it does give relief and strength too. Mridul – I think I need help with understanding some parts. Coming out of the cocoon and acknowledging what happened, come peace with out weakness and not shy from sharing , being vulnerable – This part I get it. How does the para starting “But this doesn’t mean…” fit in this context. It seems contradictory to what was said earlier. Thanks. Thanks for reading ! What i wanted to convey was that, Often when we expose ourselves we do it because somewhere we look for emotional support but at the same time we starting feeling guilty and vulnerable about it. My point was that even if we show ourselves its a sign of strength not weakness. And a higher strength lies in overcoming such traumas and weaknesses without letting the world know, or depending ourselves on others! Finding solace in my own self!It means that we cannot trust everybody and our choices should be wise. Not everyone needs to be an observer of my life. Real strength lies in depending on ourselves! But how do u manage dis? well written— keep up the good work— you could make a diff. in some lives!